Next up was Seth Green. It took a while to find a Seth Green action figure, but thanks to good old eBay I struck gold via a Scott Evil figure. The decapition of Seth Green was by far one of the hardest parts of this project, both in terms of the hard task of physically separating the head from the body (damn you, well-crafted McFarlane Toys! ), and also in terms of having to look him directly in the eyes as the knife slowly made is way through his neck. I was not proud of myself and I even called my girlfriend that night to say that I did a very bad thing. I couldn't elaborate, obviously. For sake of clarity, I am not a depraved psychopath or a terrorist. By contrast, the third Pez dispenser in the set, Melman the Giraffe, required considerably less effort. I simply ordered it from my good friends at the Pez Collector's Store and it was here in no time. After superglueing the Super Grover and Seth Green heads to their bases, I was nearly done with the dispensers. Seth Green was looking mighty fine on his own, even if I had to repaint his base (it was originally yellow, but I changed it to green, because hey, it's Seth Green). However, I wanted to put some finishing touches on Super Grover, since it was to be particularly special. My girlfriend, a big Grover fan, had often lamented that the Sesame Street set that came out a few years back did not include Grover. So I cut off the "G" logo from the original pen from eBay and glued it to the base, and then I got some purple felt from JoAnn Fabrics for the cape. Here is the final product. As you can see, Super Grover looks right at home with the official Sesame Street Pez. With all the dispensers ready to go, all that was missing was a display case. After much searching I decided on a tin from Michaels. For the interior, I used black foam on the bottom and the background, along with some velcro along the sides for support. Here is a pic of the interior in progress- notice that for the bottom, I started with a strip of foam and then added a second strip with holes cut in. The feet of the dispensers would eventually fit into these holes. For the outside label, I used a shipping label from Staples along with some more trial and error with Microsoft Word. And... drum roll please... here is the final result. I gave this set to her along with a photo album of some pictures I took along the way (many of which are also found above). She was completely surprised and liked it very much. I think it's safe to say it was a big hit. This was the first time I ever created a custom Pez dispenser, let alone two. 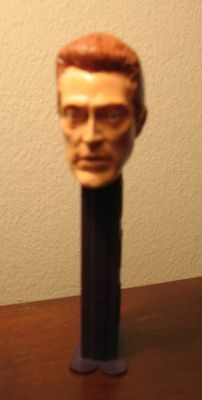 I had seen several examples of well-done custom Pez (ahem...) as well as some other examples that left a lot to be desired. While I knew that I wouldn't be able to achieve Walkenesque glory on my first try, I think I did a fairly decent job with Super Grover and Seth Green. Where the craftmanship was at certain points less than professional, and I often found myself entering uncharted territory (to the delight of Michaels, Inc. I am sure), the level of time, effort, creativity, and love that I invested in this project covered ground. While I couldn't predict my girlfriend's exact reaction, I knew that she would at least like the subject matter and that alone would go a long way. The ironic part about this project was that I, as a Pez collector, was the one giving away this one-of-a-kind set of Pez. But I think that my passion for Pez collecting only added to the enjoyment I felt as I worked through the many aspects of it, and it made it that much more of a special gift to give and receive. So, will I ever return to the world of custom Pez creation? At the moment, the answer is an emphatic no. Other Pez-related activity will keep me quite busy over the next few months, for sure. But one day, perhaps, I'll think about the month of March 2009 and remember what it was like to create a unique Pez that had never existed before, and never will again. And whether for gifting, selling, or simply adding to my own collection, it will be yet another reminder of how proud I am to be a Pezhead. "I'm Ron Burgundy. Go flip some Pez, San Diego."